Swirls and stars oval laser cut card layer in a linen textured finish. These card fronts are great for so many types of card making projects. 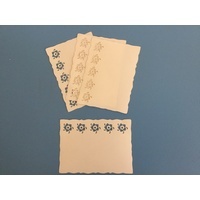 With space to display your latest paper tole project, then add them to either a plain white card or coloured card, they are almost like instant card making. 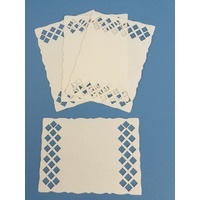 These would be great for using as layers on Christmas cards, just add paper toles, stickers or stamped images. 3 x swirl and stars oval card fronts 13cm x 9.5cm.